A blast — well, more of a bolt — from Air Force’s football past will be eligible for the College Football Hall of Fame this year, but he’s got a crowded field to deal with. 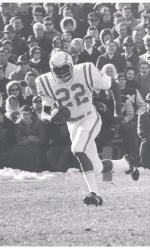 Ernie Jennings, a first-team All-American wide receiver in 1970 who led the Falcons to the 1971 Sugar Bowl, was among the 77 players and coaches to make the Hall’s first cut, the Air Force Academy announced Tuesday. His 74 catches for 1,289 yards and 17 touchdowns remain single-season Air Force records; he also holds all the school’s career marks (148 catches, 2,392 yards, 28 TDs). His performance in 1970 was enough for an eighth-place finish in Heisman Trophy balloting. Jennings’ all-purpose yardage mark held up until Chad Hall came around. Former Navy coach Wayne Hardin returns to the ballot this year — he’s been on every time since at least 2006. His 1963 Navy team ranked second in the nation, he coached two Heisman winners (Joe Bellino in 1960 and Roger Staubach in ’63), and he’s the all-time leader in wins at Temple (80). Air Force defensive back Scott Thomas made the Hall last year. Falcons legends Fisher DeBerry, Chad Hennings and Brock Strom are also members, but even reaching the nominee stage requires incredible success on the college gridiron, as evidenced by these eligibility rules. The rest of the nominees can be found here. Names range from memorable college standouts (Oklahoma linebacker Brian Bosworth, Nebraska quarterback Tommie Frazier, Wisconsin running back Ron Dayne, Notre Dame wideout Raghib “Rocket” Ismail) to pro stars (Southern Methodist RB Eric Dickerson, Arizona defensive end Tedy Bruschi), to Michigan State wideout Kirk Gibson, whose professional sports career went a different direction. This year’s class will be announced May 7.